There is nothing quite like a good duo–a perfect pairing. We have the undeniable power of peanut butter and jelly, fish and chips, and Batman and Robin. Nothing beats the greatness of the perfect duo, whether it be food, comedy, sports, or real-life. I am appreciating more and the more the need for teamwork and compromise and heck, just plain old chemistry. 1. Burger and fries (or beer). I have expressed before my love of burgers and the right side of fries can catapult any burger into the extremely delicious range. Although occasionally, the right beer can do the same thing. Yum. My stomach is growling just thinking about it. 2. Laverne and Shirley. Okay, yes, this was before my time, so to speak. As a kid however, I would tune in to re-runs to watch the undeniable chemistry between these two goofy roommates. 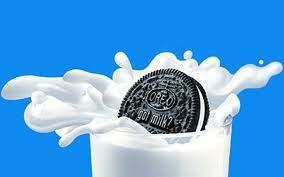 3.Oreos and milk. I don’t even like milk, but I cannot resist having a glass of the frosty white stuff whenever I have the pleasure of polishing off a sleeve of Oreos. Since going gluten-free about a year ago, Oreos have been a never-ending craving. I found a recipe for the gluten free version though and am ready to pour a glass of milk. 4. Calvin and Hobbes. My dad is a bit of an artist (as am I) and drawing Calvin and Hobbes, the adventures of a 6 year-old and his “imaginary” tiger in their mischievous, sometimes devious behavior, is a favorite memory of mine. 5. Sir Charles Barkley and KJ. Okay, I live in Arizona and that makes me a Phoenix Suns fan. We haven’t won much, but we’ve got heart. Nothing conjures up such sweet sports memories as the days of watching the charismatic and talented duo of Charles Barkley and Kevin Johnson dominate the Western Conference. Arizona misses you and misses the glory days of 1993. 6. Chips and guacamole. I like salsa, but I looooove me some guacamole. 7. Ginger Rogers and Fred Astaire. I long for the days when men were men (and wore hats) and ladies were ladies (and wore gloves). When men asked women to dance and not only did they dance, but they flew–they floated–they mesmerized. 8. Ren and Stimpy. Without a doubt, my personal all-time favorite cartoon duo. I laugh. I cry. I snort. It is perfect. It is gross. It is Ren and Stimpy. 10. Me and the hubster. Yes, this a little cheesy, but it is oh so true. My husband and I are a great duo. He thinks God just totally hooked us up and I agree. However, I also think there might be a shred of luck involved. I mean you can’t really know how well you will live with someone until you, well, live with them. We live life side-by-side so well. We are friends, teammates, partners in crime (metaphorically speaking). Duos rock! Share with me! What or who are some of your favorite duos and why? Cartoons? Food? Sports? Real-life? Lay it on me…. P.S. I have had the tremendous honor of having some of my content used over at Churchleaders.com. The current post is “God’s Tagline“, one I wrote a few weeks ago. Please stop by and leave a comment and show me some love. I would be blessed if you did so. Also, coffee and quiet time. Jon Acuff blogged about that recently and I’m in the same boat. Something about a warm mug full of coffee in my hand while I read my Bible is soothing to my soul. mmm Britanny, a girl after my own heart or should I say stomach? Every year for my birthday my mother provides me with a chocolate raspberry cake. She loves me. I like coffee with most anything, although during pregnancy not only can I not have it…I don’t like it. Currently I enjoy sipping chamomile tea when reading the Word. It is soothing, isn’t it? Cuppa tea and a good book. Grilled cheese and tomato soup. (chocolate and raspberry, chocolate and almonds). A good walk and my dog. A calm breeze and tall trees. A quiet spot and a cool creek. My brokenness and God’s gentle sweetness. Great list Dee Dee. I love grilled cheese and tomato soup. I think I might be craving it right now, in fact. And this: “My brokenness and God’s gentle sweetness.” So beautiful and so true. My big pink down comforter and Gilmore Girls. This is how I sooth my soul of late. I also like, peace and quiet, a hot bath and candles, khalua and milk, and fresh bathed baby with jammies. You have Gilmore Girls. I currently have Gray’s Anatomy. Yours is much more wholesome than mine. I have no pink blanket but a teal, ratty, fairly hideous sweater that I wrap myself up in. Bathed babies and jammies is the best! Oh such a good one. Bed and a book. Preferably a cozy British mystery. Pizza and root beer. Sadly, since I am gluten free now, pizza is a rare, rare thing. And I am giving up sodas for Lent. Hrmph. Bed and book is me too. I do 90% of my reading, while lying in bed. I hope you find some delicious gluten-free pizza somewhere soon. It’s not too hard to make too if you are feeling motivated. I feel your pizza pain. I make my own pizza dough, and it’s really easy, and I see lots of GF recipes and ways to do this. You should really check it out and get your yummy pizza fix back!! Nicole, this is great! I literally just added a few of my favorite Fred Astaire and Ginger Rogers movies to my Netflix queue. Swing Time is on its way tomorrow and I haven’t watched it in years. Time to introduce the husband to my childhood loves! Mine are: How I met your mother and The Office. She & Him. Travel and my camera. Chai and a choc chip cookie (for dunking, of course). My sis & bro, so lucky to have one of each. Sushi and my man, absolutely favorite date night. 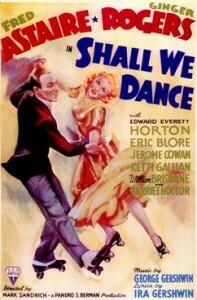 Hooray for the shared love of Fred Astaire! So cool. I hope your hubby enjoys it too! Chai and chocolate chip cookie–definitely gonna try that and soon. We love sushi too and always makes for a great date night! Thanks for sharing your fun list Heather. Can you tell that I liked cartoons as a kid? Previous Previous post: What Do Men Want?